Every generation has its own medical scourge that must be overcome: polio in the 1950s, cancer in the 1960s, heart disease in the 1970s, and AIDS in the 1980s. 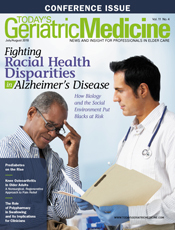 But for the past three decades, Alzheimer's disease (AD) has emerged as our generation's insurmountable medical menace. In fact, AD continues to grow in prevalence, with one of every three Americans older than 85 having dementia. At a cost to our economy of more than $250 billion annually, dementia has become the costliest disease. And this does not take into account the devastating social and emotional toll on patients' families. We are, however, on the brink of major advances. In recent years, there have been breakthroughs in our ability to identify the specific brain changes associated with AD before any symptoms appear. This is called the preclinical stage, and the ability to detect AD in its earliest stages is allowing us to test new therapies that have the greatest chance for success. AD is characterized by the accumulation of amyloid plaques and neurofibrillary tangles. Genetic, epidemiological, and animal model studies indicate that the accumulation of beta-amyloid, a toxic protein fragment that is the major constituent of the plaques, leads to neuronal injury and, subsequently, cognitive decline and dementia. Therefore, reducing beta-amyloid may reduce the risk of developing dementia due to AD. New positron emission tomography (PET) tracers now allow for direct visualization and quantification of amyloid plaques in the brain and are a key inclusion criterion for many AD prevention trials that are targeting beta-amyloid. Such trials aim to remove or block the production of beta-amyloid in the brain. Many lessons can be learned about early intervention for AD from the field of heart disease. Until LDL cholesterol was discovered as the culprit that caused atherosclerotic plaques in the arteries that ultimately blocked blood flow and caused heart attacks, heart disease was being treated only after individuals suffered heart attacks, which people often did not survive. Once the role of cholesterol was identified and drugs were developed to minimize the build-up of dangerous arterial plaques, heart disease rates and death from heart attacks plummeted. Similar progress can be anticipated in AD. We can now visualize beta-amyloid in the brain and have interventions that can lower it over time. The key will be to attack the problem early enough, before there is significant neuronal injury. Both animal data and recent clinical trial results with antiamyloid agents suggest that previous attempts to intervene may have been too little, too late. Fortunately, a number of trials in both genetic and biomarker-defined at-risk older individuals thought to be in the preclinical stages of AD are ongoing or being planned. In addition, therapeutic trials for the clinical stage of mild cognitive impairment or prodromal AD are being planned as well. However, the complexity and expense of the recruitment process for these secondary prevention trials are extremely challenging, with trial enrollment representing the greatest bottleneck for drug development for AD. Thus, there's a growing need to improve the current clinical trial recruitment and assessment process for these early intervention trials. The Alzheimer Prevention Trials (APT) Webstudy is being coordinated by the Alzheimer's Therapeutic Research Institute of the University of Southern California, in conjunction with Harvard Medical School and the Cleveland Clinic, with funding from the National Institutes of Health. This web-based cognitive research tool aims to accelerate enrollment for early-stage Alzheimer's clinical trials. The goal is to develop an online group of individuals who are old enough to be at higher risk for developing AD and who allow their cognitive test results to be tracked over time. People who join the APT Webstudy and are found to be of particularly high risk will be offered the opportunity to participate in comprehensive evaluations at one of the nationwide clinical sites and, if eligible, to participate in clinical trials for AD. Once registered online, individuals will be asked to consent to participate in the APT Webstudy to answer some questions about education, lifestyle, and relevant medical conditions, and then to complete the Cognitive Function Index (CFI) survey and the Cogstate Brief Battery assessment every three months. The CFI is an assessment that tracks early, subjective changes in cognitive function in older individuals without objective evidence of clinical impairment at baseline. It's a series of questions that assess for change in functioning in everyday abilities. The change in CFI score over time may be useful in identifying individuals at increased risk for developing AD in the future. The Cogstate Brief Battery is a validated tool used to track subtle changes in cognitive function in older individuals and employs the use of playing cards to assess cognitive domains such as memory and attention. Participants are asked to return to the website every three months to complete the CFI and Cogstate assessments again in order to track longitudinal change. The individuals identified as being at elevated risk within the APT Webstudy pool of online participants will be referred for in-person clinical and biomarker assessments at nearby clinical trial sites. Those who are then found to have biomarker abnormalities, such as positive amyloid PET scans, will be eligible to join in a Trial Ready Cohort where they will be followed at semiannual in-person visits and with quarterly remote APT Webstudy assessments until they are ready for enrollment in therapeutic trials aiming to slow progression of early stage AD. Biomarker-negative individuals will continue remote web-based follow-up in the APT Webstudy; if longitudinal trajectories and changes to other risk factors indicate increasing risk, those participants will be eligible for repeat in-person clinical and biomarker assessment. Anyone older than the age of 50 with an interest in participating in Alzheimer's clinical research studies is eligible to join. Participants in the APT Webstudy will have access to free, secure, personalized web-based tools to assess and track memory and thinking performance as well as access to information about ongoing AD therapeutic trials. The website is www.aptwebstudy.org. It's only by working together that our generation can overcome the AD epidemic. By informing your patients of this opportunity, you'll enable them to join the effort to develop effective therapeutics. Together, we can target AD at its earliest stages, where we have the greatest hope of slowing or preventing this relentless neurodegenerative disease. — Michael S. Rafii, MD, PhD, is clinical director of the Alzheimer's Therapeutic Research Institute and an associate professor of neurology at the Keck School of Medicine of the University of Southern California. — Paul S. Aisen, MD, is founding director of the Alzheimer's Therapeutic Research Institute and a professor of neurology at the Keck School of Medicine of the University of Southern California.